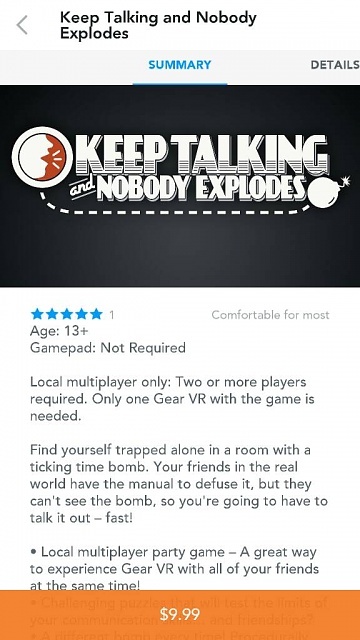 One of the "complaints" about VR games I've heard is that it's kind of isolating. One person plays - everyone else watches. One person is fully engaged and having fun - everyone else is sitting or standing waiting their turn to put the HMD on. This game, however, seems like it can successfully involved several people to play and work together to solve puzzles, before the bomb explodes. Maybe even teams of people at a party (admittedly a geek party) can compete and see who can diffuse the most bombs in an hour? "come on guys, only 30 seconds left!!!" Very cool concept and, at least in the movies, this is how bombs are defused. 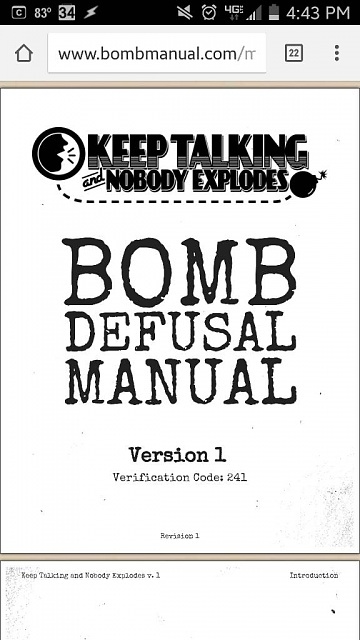 The diffuser has to verbally tell the bomb experts what he sees, the bomb experts have to frantically lookup the directions and figure out the secret codes to verbally tell the bomb diffuser EXACTLY what to do and what NOT to do...all before time runs out and the bomb explodes. Sounds like a blast (pun intended)! If you travel via airlines with your Gear VR, a word of advice - don't play this game in the airport terminal or on the plane. In fact, you might NOT even want to pull the manual out and read it. I bought the game. Wow, it's so much fun to play! My 11 year old daughter and I have been playing for the last 3...no, wait... 4 hours straight (I can believe it's been that long) with only a short lunch break. And we're still only on the second level with so much more to play and explore. We played each puzzle 3 times each so we could get more familiar with it and get fastest each time. This seemed to be a good strategy to beat the 5:00 minute timer as the complexity and number of puzzles increased. She is really into it and does not want to stop. When we stopped to eat lunch, the "Keep Talking and Nobody Explodes" game is all she could talk about with me, her mom and her brother. She is normally very quiet and does not talk too much. She is hooked and so am I. We took turns wearing the VR and reading the directions. I think I enjoy the non VR part (reading the difusal instructions) the best because you have to do most of the thinking and interpretation of what the diffuser is telling you. Imagine that... a VR game and the best part of it has nothing to do with VR but rather a bunch of pieces of flat 2D paper. How ironic. My initial impression was that $10 was too high but if you compare it to the price of some good board games ($20 to $30+), it's actually very cheap. 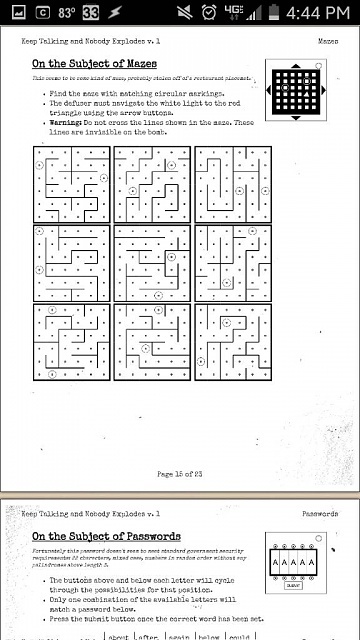 I can really appreciate the amount of work it took to create the initial idea and all the intricate "puzzles" you have to solve. This game has a lot of replay value. I can't wait to get more people involved, create some two person teams, and see which teams can solve the most puzzles in the quickest time. Well done Steel Crate Games, we'll done! 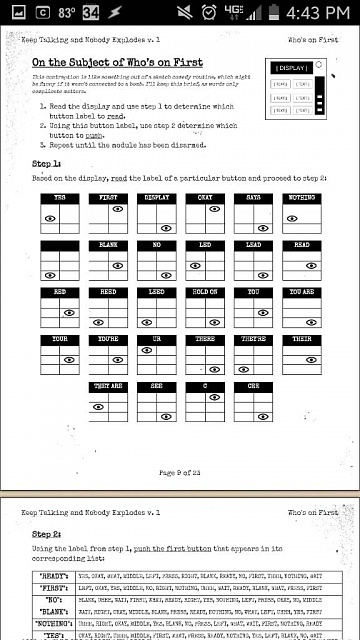 In this game play video of "Keep Talking and Nobody Explodes" the YouTuber says he thinks this game could be Game of the Year. Can you play this with any android device on a Google Cardboard? Posted via my Nokia 8210 from the inside of a Kitten. Why won't my Zeepad 7drk download a new game when I have a new micro sd and sufficient space?